For other people with the same name, see Howard Carter (disambiguation). Howard Carter (9 May 1874 – 2 March 1939) was a British archaeologist and Egyptologist who became world-famous after discovering the intact tomb (designated KV62) of the 18th Dynasty Pharaoh, Tutankhamun (colloquially known as "King Tut" and "the boy king"), in November 1922. Howard Carter was born in Kensington on 9 May 1874, the son of Samuel John Carter, an artist, and Martha Joyce Carter (née Sands). His father trained and developed Howard's artistic talents. Carter spent much of his childhood with relatives in the Norfolk market town of Swaffham, the birthplace of both his parents. Nearby was the mansion of the Amherst family, Didlington Hall, containing a sizable collection of Egyptian antiques, which sparked Carter's interest in that subject. 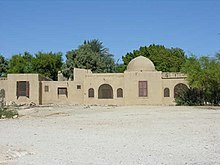 In 1891 the Egypt Exploration Fund (EEF), on the prompting of Mary Cecil, sent Carter to assist an Amherst family friend, Percy Newberry, in the excavation and recording of Middle Kingdom tombs at Beni Hasan. Although only 17, Carter was innovative in improving the methods of copying tomb decoration. In 1892, he worked under the tutelage of Flinders Petrie for one season at Amarna, the capital founded by the pharaoh Akhenaten. From 1894 to 1899, he worked with Édouard Naville at Deir el-Bahari, where he recorded the wall reliefs in the temple of Hatshepsut. In 1899, Carter was appointed to the position of Chief Inspector of the Egyptian Antiquities Service (EAS). He supervised a number of excavations at Thebes (now known as Luxor). In 1904, he was transferred to the Inspectorate of Lower Egypt. Carter was praised for his improvements in the protection of, and accessibility to, existing excavation sites, and his development of a grid-block system for searching for tombs. The Antiquities Service also provided funding for Carter to head his own excavation projects. Carter resigned from the Antiquities Service in 1905 after a formal inquiry into what became known as the Saqqara Affair, a noisy confrontation between Egyptian site guards and a group of French tourists. Carter sided with the Egyptian personnel. In 1907, after three hard years for Carter, Lord Carnarvon employed him to supervise excavations of nobles' tombs in Deir el-Bahri, near Thebes. Gaston Maspero had recommended Carter to Carnarvon as he knew he would apply modern archaeological methods and systems of recording. In 1914, Lord Carnarvon received the concession to dig in the Valley of the Kings, Carter was again employed to lead the work. However excavations and study were soon interrupted by the First World War, Carter spending these war years working for the British Government as a diplomatic courier and translator. He enthusiastically resumed his excavation work towards the end of 1917. By 1922, Lord Carnarvon had become dissatisfied with the lack of results after several years of finding little. He informed Carter that he had one more season of funding to make a significant find in the Valley of the Kings. On 26 November 1922, Carter made a "tiny breach in the top left-hand corner" of the doorway, with Carnarvon, his daughter Lady Evelyn Herbert, and others in attendance, using a chisel that his grandmother had given him for his 17th birthday. He was able to peer in by the light of a candle and see that many of the gold and ebony treasures were still in place. He did not yet know whether it was "a tomb or merely an old cache", but he did see a promising sealed doorway between two sentinel statues. Carnarvon asked, "Can you see anything?" Carter replied with the famous words: "Yes, wonderful things!" 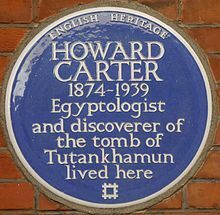 Carter had, in fact, discovered Tutankhamun's tomb (subsequently designated KV62). The next several months were spent cataloguing the contents of the antechamber under the "often stressful" supervision of Pierre Lacau, director general of the Department of Antiquities of Egypt. On 16 February 1923, Carter opened the sealed doorway and found that it did indeed lead to a burial chamber, and he got his first glimpse of the sarcophagus of Tutankhamun. 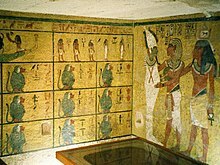 The tomb was considered the best preserved and most intact pharaonic tomb ever found in the Valley of the Kings, and the discovery was eagerly covered by the world's press, but most of their representatives were kept in their hotels, much to their annoyance. Only H. V. Morton from The Times newspaper was allowed on the scene, and his vivid descriptions helped to cement Carter's reputation with the British public. Carter's notes and photographic evidence indicate that he, Lord Carnarvon, and Lady Evelyn Herbert entered the burial chamber in November 1922, shortly after the tomb's discovery and before the official opening. Towards the end of February 1923 a rift between Lord Carnarvon and Carter, probably caused by a disagreement on how to manage the supervising Egyptian authorities, temporarily closed excavation. Work recommenced in early March after Lord Carnarvon apologised to Carter. Later that month Lord Carnarvon contracted blood poisoning while staying in Luxor near the tomb site. He died in Cairo on 5 April 1923. 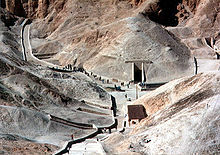 Lady Carnarvon retained her late husband's concession in the Valley of the Kings, allowing Carter to continue his work. Carter's meticulous cataloguing of the thousands of objects in the tomb continued until 1932, most being moved to the Egyptian Museum in Cairo. There were several breaks in the work, including one lasting nearly a year in 1924–25, caused by to a dispute over what Carter saw as excessive control of the excavation by the Egyptian Antiquities Service. The Egyptian authorities eventually agreed that Carter should complete the tomb's clearance. Despite being involved in the greatest archaeological find of his time, Carter received no honour from the British government. However, in 1926, Carter received the Order of the Nile, third class, from King Fuad I of Egypt. Carter had authored a number of books on Egyptology during his career. During those years he had also been awarded an honorary degree of Doctor of Science by Yale University and honorary membership in the Real Academia de la Historia of Madrid, Spain. After the clearance of the tomb had been completed, Carter retired from archaeology and became a part-time agent for collectors and museums, including the Cleveland Museum of Art and the Detroit Institute of Arts. In 1924 he toured Britain, as well as France, Spain and the United States, delivering a series of illustrated lectures. Those in New York City and other US cities were attended by large and enthusiastic audiences, sparking American Egyptomania. Carter died at his London flat at 49 Albert Court, next to the Royal Albert Hall, on 2 March 1939, aged 64 from Hodgkin's Disease. Few people attended his funeral, one of them was his older brother William (b. 1863) who died in the same year. 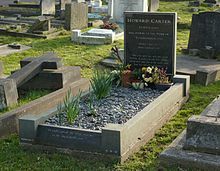 Carter is buried in Putney Vale Cemetery in London. Probate was granted on 5 July 1939 to English Egyptologist Henry Burton and to publishing entrepreneur Bruce Sterling Ingram, Carter is described as Howard Carter of Luxor, Upper Egypt, Africa and of 49 Albert Court, Kensington Grove, Kensington, London, his estate was valued at £2002. The second grant of Probate was issued in Cairo on 1 September 1939. His epitaph reads: "May your spirit live, may you spend millions of years, you who love Thebes, sitting with your face to the north wind, your eyes beholding happiness", a quotation taken from the Wishing Cup of Tutankhamun, and "O night, spread thy wings over me as the imperishable stars". On 9 May 2012, Google commemorated Carter's 138th birthday with a Google doodle. A paraphrased extract from Carter's diary of 26 November 1922 is used as the plaintext for Part 3 of the encrypted Kryptos sculpture at the CIA Headquarters in Langley, Virginia. He is referenced in Hergé's volume 13 of The Adventures of Tintin: The Seven Crystal Balls (1948). A person dresses up as him at Nucky's party in the Boardwalk Empire episode, Resolution. As the main character in 2016 BBC miniseries Tutankhamun, portrayed by Max Irons. Carter is a reoccurring figure in Elizabeth Peter's Amelia Peabody mystery series, one of several historical characters that appear in Peter's series set in the archaeological circles of Egypt and England in the late 19th and early 20th centuries. He is referenced in Sally Beauman's The Visitors, a novel re-creation of the hunt for Tutankhamun's tomb in Egypt's Valley of the Kings. In Laura Lee Guhrke's historical romance novel Wedding of the Season (2011), Carter's telegram to the fictional British Egyptologist, the Duke of Sunderland, reports discovering "steps to a new tomb" and creates a climactic conflict. He is a key character in Christian Jacq's book The Tutankhamun Affair. James Patterson and Martin Dugard's book The Murder of King Tut focuses on Carter's search for King Tut's tomb. He appears as a main character in Muhammad Al-Mansi Qindeel's novel A Cloudy Day on the West Side. He is parodied in the book Motel of the Mysteries by David Macaulay, with a character in the book named Howard Carson. In The Red Pyramid, part of Rick Riordan's book series The Kane Chronicles is based on ancient Egyptian mythology, one of the main characters given name is Carter. ^ "From teh archives – Egyptologist Howard Carter dies". The Guardian. Retrieved 11 January 2019. ^ Swaffham history Retrieved 12 November 2013. ^ Swaffham museum Retrieved 20 May 2012. ^ Barbara Ford, Howard Carter, Searching for King Tut (Freeman & Company, 1995, ISBN 0-7167-6587-X), p. 19. ^ James, T. G. H. Howard Carter, I.B. Tauris Publishers, Revised edition 2006, ISBN 978-1845112585, chapter. ^ Winstone, H. V. .x.4 F. (2006). Howard Carter and the discovery of the tomb of Tutankhamun (rev. ed.). Manchester: Barzan. ISBN 1-905521-04-9. ^ a b Bill Price. Tutankhamun, Egypt's Most Famous Pharaoh. pp. 121–122. Published Pocket Essentials, Hertfordshire. 2007. ISBN 9781842432402. ^ Carnarvon, Fiona (2011). Highclere Castle. Highclere Enterprises. p. 59. ^ Christianson, Scott (5 November 2015). "A Look Inside Howard Carter's Tutankhamun Diary". Smithsonian Magazine. Retrieved 6 July 2018. ^ Lord Carnarvon's description, 10 December 1922, quoted in: Reeves, Nicholas; Taylor, John H. (1992). Howard Carter before Tutankhamun. London: British Museum. p. 141. ISBN 0-7141-0952-5. ^ Reeves, C. N. (1990). Valley of the Kings: the decline of a royal necropolis. London: Kegan Paul. p. 63. ISBN 0-7103-0368-8. ^ Bill Price. Tutankhamun, Egypt's Most Famous Pharaoh. pp. 130–131. Published Pocket Essentials, Hertfordshire. 2007. ISBN 9781842432402. ^ "Report of Carnarvon's death". New York Times. 5 April 1923. Retrieved 12 August 2008. ^ Bill Price. Tutankhamun, Egypt's Most Famous Pharaoh. pp. 132–134. Published Pocket Essentials, Hertfordshire. 2007. ISBN 9781842432402. ^ William Cross. Carnarvon, Carter and Tutankhamun Revisited: The Hidden Truths and Doomed Relationships. p. 129 Published by author. 2016. ISBN 9781905914364. ^ "Howard Carter, 64, Egyptologist, Dies". Goodreads. 3 March 2018. Retrieved 19 August 2018. ^ "Howard Carter, 64, Egyptologist, Dies". New York Times. 3 March 1939. Retrieved 19 August 2018. ^ William Cross. Carnarvon, Carter and Tutankhamun Revisited: The Hidden Truths and Doomed Relationships. p. 92 Published by author. 2016. ISBN 9781905914364. ^ Nicholas Reeves, John H. Taylor, Howard Carter before Tutankhamun. British Museum Press; London 1992, ISBN 0-714-10959-2, p. 180. ^ "Putney Vale cemetery". Retrieved 16 February 2010. ^ probatesearch.service.gov.uk Retrieved 2 March 2018. ^ Nicholas Reeves, John H. Taylor, Howard Carter before Tutankhamun. British Museum Press; London 1992, ISBN 0-714-10959-2, p. 188. ^ cf the prayer to the Goddess Nut found on the lids of New Kingdom coffins: "O my mother Nut, spread yourself over me, so that I may be placed among the imperishable stars and may never die." "Text From Egypt Centre Trail: Reflections Of Women In Ancient Egypt". 2001. Archived from the original on 11 June 2011. Retrieved 28 April 2011. ^ "Howard Carter's 138th Birthday". Google Doodle. Google. 9 May 2012. Retrieved 10 August 2015. ^ Redmond, J.; Ensor, D. (19 June 2005). "Cracking the code: Mysterious 'Kryptos' sculpture challenges CIA employees". CNN. ^ Hergé (1944). The Seven Crystal Balls. The Adventures of Tintin. 13. Le Soir. ISBN 2-203-00112-7. ^ "Howard Carter (Character)". IMDb.com. Archived from the original on 8 November 2017. ^ The Visitors Retrieved 20 March 2015. ^ Guhrke, Laura Lee (2011). Wedding of the Season. Avon Books. ISBN 978-0-06-196315-5. ^ The Tutankhamun Affair Retrieved 23 May 2009. ^ Patterson, Dugard, James, Martin (2010). The Murder of King Tut. Grand Central Publishing. ISBN 978-0-446-53977-7. ^ Book reviews Retrieved 17 March 2010. ^  Retrieved 13 January 2017. Cross, William. Carnarvon, Carter and Tutankhamun Revisited: The Hidden Truths and Doomed Relationships. Book Midden Publishing, 2016. ( ISBN 978-1905914-36-4 ). Wikimedia Commons has media related to Howard Carter. Schulz, Matthias (15 January 2010). "Did King Tut's Discoverer Steal from the Tomb?". Der Spiegel Online. Retrieved 19 January 2010.